We have come a long way as a construction and infrastructure development company. But the journey is only beginning in an industry that will attract 1000 billion dollars in investment over the next 5 years. We seek dynamic professionals who want to realize their full potential and be recognized for their merit. Join us for a fulfilling and rewarding career. 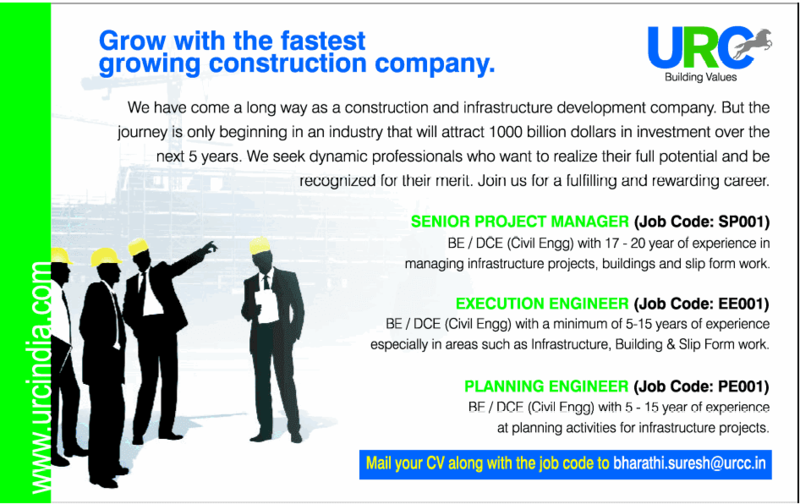 BE / DCE (Civil Engg) with 17 - 20 year of experience in managing infrastructure projects, buildings and slip form work. BE / DCE (Civil Engg) with a minimum of 5-15 years of experience especially in areas such as Infrastructure, Building & Slip Form work. RF / DCF (Civil Engg) with 5-15 year of experience at planning activities for infrastructure projects.